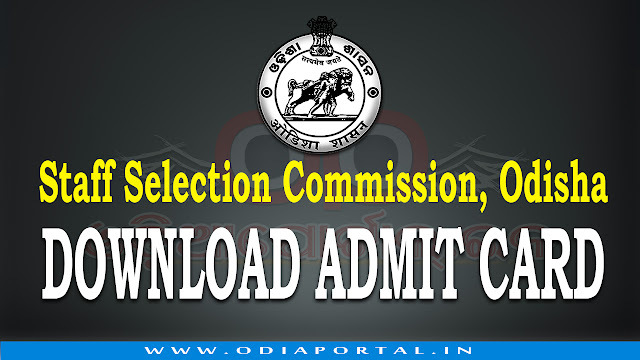 Odisha SSC: Download Admit Card for "Junior Stenographer (2015 - Heads of Dept) Exam 2017"
The Staff Selection Commission, Odisha has published Admit Cards or Hall Ticket Cards for Candidates who are waiting to seat in written examination for the Post of Junior Stenographer (2015 - Heads of Departments). The Staff Selection Commission, Odisha is going to conduct Language test in English and Odia for Junior Stenographer (2015 - Heads of Departments) Examination. The examination is going to conduct on 9th July, 2017 at 10.00AM. We will provide question papers for this examination on 10th of July after the exam. Go to Odisha SSC Website or Click Here. Use your Application ID & Password to login. After successful Login, You could see your details. Now print your Admit card or Save as PDF for future Use. The examination will be objective type, and OMR answer sheet will be supplied to canididates in the examination hall. Write your roll number correctly in the space provided in the OMR Answersheet. Candidates shall be allowed to take the examination only at the centre specified and as per programme mentioned in the admission letter. No candidate shall enter the examination hall with any book, script, note, loose paper, calculator, pager, mobile phone, other communication devices or any writing on their person etc. The candidate is advised not to enter the examination hall with MOBILE PHONE or any OTHER COMMUNICATION device. Any infriengement of this instruction will entail debarment of the candidate from the particular examination. No candidate shall be admitted to the examination hall before or after half an hour of commencement of examination nor shall be allowed to leave the hall before expiry of time of the examination. No examinee shall be allowed to leave the hall with OMR answer sheet. No candidate should talk to another/ adopt any unfair means/ possess any written material in his person or clothing on or about his seat/ cause any disturbance in the examination hall/ impersonate anybody in the examination. Smoking / being in a state of intoxication in the hall are prohibited. Candidate must abide by the instructions given in this Admission Letter, in the OMR Answer Sheet and any further instructions which may be conveyed by the authorities in charge of conduct of examination. Failure on the part of the candidate to observe the rules may entail his / her debarment from taking the examination and imposition of any penalty prescribed under Rules. The candidate should bring one Identity proof like Voter Identity Card/Driving License/Passport etc. issued by any Govt. Authority for verification and when required during the examination.